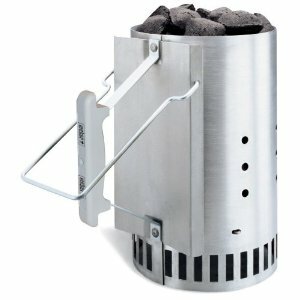 A vented, vertical cylinder-shaped canister that you place in the firebox of a charcoal grill. Crumple newspaper in the bottom, add charcoal briquettes to the top, and then light paper for quick, even starting of charcoal. When all the charcoal is ignited (10 to 15 minutes), remove the chimney and spread the hot coals before grilling food. It has a large, easy-to-grasp handle for safe handling.